Rhyming picture books are always firm favourites in Early Years settings. Take a look at this fantastic and simple resource for some great ideas for working rhyming fun into your weekly routines. For example, you could cut out the pictures of rhyming pairs on the sheet and paste them onto cards. 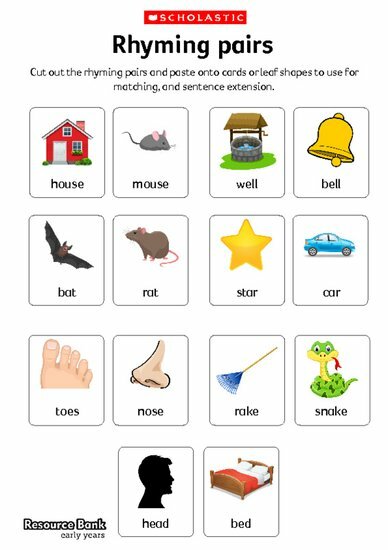 Ask a child to select one pair, and make up a short sentence about them. For example: ‘The snake ate the cake’. Or you could muddle the cards up, and invite individual children to pair them together again. Try cutting out the rhyming pairs from the sheet and pasting them onto large green leaf shapes. Cut out a large paper tree with bare branches, and place at child level on a wall. Give each child one leaf of a rhyming pair, and ask them to find the matching one. When they have both, ask them to glue them on each side of a branch of the tree, as a pair.